Due to weather forecasts for Saturday night and Sunday morning, I've decided to cancel the Traveling Choir performance at Zion, Van Dyne on Sunday, Dec. 21. Students should start calling on the phone tree. I don't know at this time if or when the performance will be rescheduled. The 2008 WLA Christmas Concert "Come and Worship" will be presented twice: Monday, Dec. 22, 2008 at 7 PM and Tuesday, Dec. 23 at 1 PM. Both concerts will be the same. The concert is based on the words of the refrain of the timeless Christmas hymn "Angels from the Realms of Glory." The hymn verses provide the structure of the concert, reminding us in song that the baby Jesus was first announced by the angels to the shepherds, sought by the wise men and longed for by saints of old. The baby Jesus, true God in human form, came to this earth to redeem sinners in all nations to and for all creation. After I ran out of space on my previous free online storage, I needed to find a new place to upload the recordings of the WLA Traveling Choir Sunday performances. I've moved over to Google Sites and created page just for WLA Recordings. You can also use the Quick Link on the top right of this blog to get there. The first recordings I've uploaded are the nine songs Traveling Choir sang at Grace, Oshkosh on Dec. 14, 2008 in their two morning services. The only song that is missing from the recordings is "Speak O Lord" from the 1st service. I forgot to turn on my digital recorder! You should be able to click on any title and download the MP3 file to your computer to listen. If it works, I'll continue to upload WLA recordings to this page. Bookmark it and watch it for weekly updates when TC is on the road or after major concerts. The WLA Traveling Choir will be staying at the Grand Hyatt, New York when they travel to New York to sing at Carnegie Hall on June 14, 2009. This will be the first time we will be staying at this hotel. The previous two times (2004 & 2007) we stayed at the Hilton on the Avenue of the Americas, which was a little closer to Carnegie Hall. Lodging at the Grand Hyatt is included for students and families who are purchasing the land package from MidAmerica Productions. Others who are making their own travel arrangements are free to make their own reservations. For the second time in less than a week God has given us a reason to drive home in the daylight and spend a night in safety with our families. Because of the impending weather (and line of sleet creeping up from the south) there will be no AK rehearsal on Monday, Dec. 8. The next practice is Wednesday, Dec. 10. We have a Christmas party on Thursday, Dec. 11 at Holiday Inn, FDL at 1 PM. On Sunday, Dec. 7, the WLA Traveling Choir will sing for the 9:15 AM service at Bethlehem Lutheran Church and for the 10:30 AM service at Martin Luther Lutheran Church, both in Oshkosh. The bus will leave WLA at 7:45 AM. Students riding the bus should be at WLA by 7:30 AM. Students driving to Bethlehem should be there by 8:15 AM. 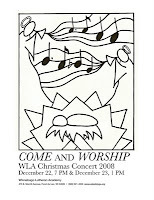 You can help promote the WLA 2008 Christmas Concert at your church, school, or place of work by downloading these posters and bulletin inserts. All downloads are PDF format.